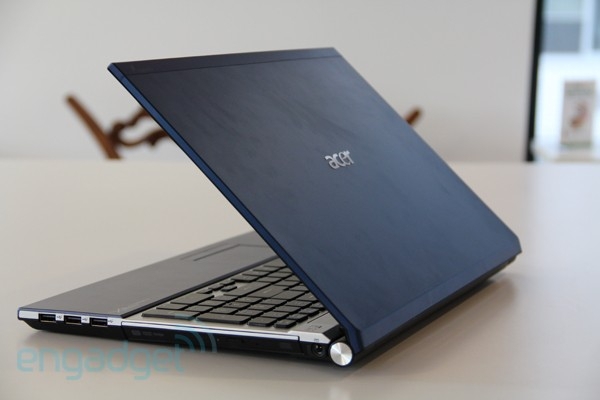 "When Acer unveiled its first Timeline laptops in 2009, these slim numbers felt like a revelation. Imagine: thin notebooks rated to last hours and hours on a charge and priced well under a grand! Fast-forward two years and that proposition seems a bit quaint, doesn't it? Pretty much every PC maker has been working on slimming down their wares and extending battery life with -- shall we say? -- mixed results. Still, Acer has kept on keeping, and its latest TimelineX laptops carry the torch as thin, long-lasting and inexpensive." With a battery-life of around 9-hours (6:25 in testing), the 15.6-inch, 5.6-pound AS5830 is defined by a somewhat industrial appearance: sharp corners and clean lines, making it seem bigger than it really is. With a plastic bottom, but aluminum lid and keyboard deck, the system "feels" light. Most shoppers will either love the design, or hate it. Well-stocked with ports, including USB 3.0, the AS5830 also includes a DVD-burner in its 1-inch thick form factor. The keyboard is surprisingly good, but emits pinging noises at times, and suffers from several oddly sized keys. The 1366x768 display is extremely glossy, the webcam okay, and the Dolby audio is better than expected, but still somewhat tinny at higher volumes. System performance is middle-of-the-pack, but graphics performance is pretty good, thanks to the NVIDIA GeForce GT 520M card with Optimus and 1GB of DDR3 video memory onboard. Overall, for $800, pretty good, but, aside from the battery life, nothing really to make it stand above other systems in this class.